Chambers of the eye. From Dorland's, 2000.
anterior chamber the part of the aqueous humor-containing space of the eyeball between the cornea and iris. counting chamber the part of a hemacytometer consisting of a microscopic slide with a depression whose base is marked in grids, and into which a measured volume of a sample of blood or bacterial culture is placed and covered with a cover glass. The number of cells and formed blood elements in the squares is counted under a microscope and used as a representative sample for calculating the unit volume. drip chamber the expanded portion of intravenous tubing into which fluid falls, where the rate of flow can be monitored if necessary. See also intravenous infusion. hyperbaric chamber an enclosed space in which gas (oxygen) can be raised to greater than atmospheric pressure; see also hyperbaric oxygenation. ionization chamber an enclosure containing two or more electrodes between which an electric current may be passed when the enclosed gas is ionized by radiation; used for determining the intensity of x-rays and other rays. 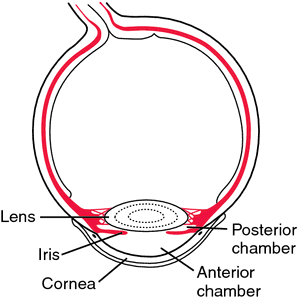 posterior chamber that part of the aqueous humor–containing space of the eyeball between the iris and the lens. vitreous chamber the vitreous humor–containing space in the eyeball, bounded anteriorly by the lens and ciliary body and posteriorly by the posterior wall of the eyeball. A compartment or enclosed space. /cham·ber/ (chām´ber) an enclosed space. anterior chamber of eye the part of the aqueous-containing space of the eyeball between the cornea and the iris. aqueous chamber the part of the eyeball filled with aqueous humor; see anterior c. and posterior c.
counting chamber the part of a hemacytometer consisting of a microscopic slide with a depression whose base is marked in grids, and into which a measured volume of a sample of blood or bacterial culture is placed and covered with a cover glass. Cells and formed blood elements in any given square can then be counted under a microscope. diffusion chamber an apparatus for separating a substance by means of a semipermeable membrane. Haldane chamber an air-tight chamber in which animals are confined for metabolic studies. hyperbaric chamber an enclosed space in which gas (oxygen) can be raised to greater than atmospheric pressure. posterior chamber of eye the part of the aqueous-containing space of the eyeball between the iris and the lens. pulp chamber the natural cavity in the central portion of the tooth crown that is occupied by the dental pulp. relief chamber the recess in a denture surface that rests on the oral structures, to reduce or eliminate pressure. Thoma-Zeiss counting chamber a common type of counting c.
vitreous chamber the vitreous-containing space in the eyeball, bounded anteriorly by the lens and ciliary body and posteriorly by the posterior wall of the eyeball. a. An enclosed space or compartment: the chamber of a pump; a compression chamber. b. An enclosed space in the body of an organism; a cavity: the four chambers of the heart. 1 a hollow but not necessarily empty space or cavity in an organ, as in the anterior and posterior chambers of the eye or the atrial and ventricular chambers of the heart. 2 a room or closed space used for research or therapeutic purposes, such as a decompression chamber or hyperbaric oxygen chamber. 1. A compartment or enclosed space. 2. Divisions of a hemocytometer. In anatomy, a small cavity. anterior chamber (AC) Space within the eye filled with aqueous humour and bounded anteriorly by the cornea and posteriorly by the iris and the part of the anterior surface of the lens which appears through the pupil. Its average axial length is 3.2 mm. See angle of the anterior chamber; aqueous flare; gonioscope; Shaffer and Schwartz van Herick method; Smith's method; optics of the eye; shadow test. chamber's of the eye The anterior, posterior and vitreous chambers of the eye. posterior chamber Space within the eye filled with aqueous humour and bounded by the posterior surface of the iris, the ciliary processes, the zonule and the anterior surface of the lens. vitreous chamber Space within the eye filled with vitreous humour and bounded by the retina, ciliary body, canal of Petit and the postlenticular space of Berger. n a chamber in which the materials of the wall and electrodes produce ionization essentially similar to that produced in a free-air ionization chamber. n an ionization chamber with walls of material of low atomic number, having the same effective atomic number as atmospheric air. n an ionization chamber with electrodes of which the spacing can be adjusted and accurately determined to permit extrapolation of its reading to zero chamber volume. n an ionization chamber in which a delimited beam of radiation passes between the electrodes without striking them or other internal parts of the equipment. The electric field is maintained perpendicular to the electrodes in the collecting region; as a result the ionized volume can be accurately determined from the dimensions of the collecting electrode and limiting diaphragm. This is the basic standard instrument for dosimetry within the range of 5 to 400 kV. n an instrument for measuring the quantity of ionizing radiation, in terms of the charge of electricity associated with ions produced within a defined volume of air. n an ionization chamber used for checking the constancy of performance of the roentgen-ray apparatus. n a small, pocket-sized ionization chamber used for monitoring radiation exposure of personnel. Before use it is given a charge, and the amount of discharge is a measure of the quantity of radiation received. n (pulp cavity), the space occupied by the pulp. n a recess in the impression surface of a denture created to reduce or eliminate pressure from the corresponding area of the oral cavity. n See chamber, ionization, free-air. n a small cylindrical or spherical chamber, usually with walls of organic material. n an ionization chamber having walls so thin that nearly all secondary corpuscular rays reaching them from external materials can penetrate them easily. n a chamber in which the walls, electrodes, and gas are selected to produce ionization essentially equivalent to the characteristics of the tissue under consideration. the part of the aqueous humor-containing space of the eyeball between the cornea and iris. an enclosed space in which gas (oxygen) can be raised to greater than atmospheric pressure. See also hyperbaric oxygenation. that part of the aqueous humor-containing space of the eyeball between the iris and the lens. the vitreous humor-containing space in the eyeball, bounded anteriorly by the lens and ciliary body and posteriorly by the posterior wall of the eyeball.